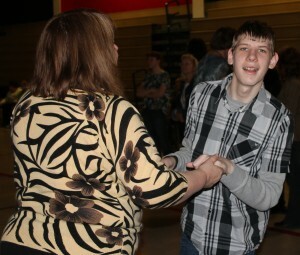 Oswego County BOCES student Rodney Worden takes a spin around the dance floor with OCB School Nurse Karen Friot during the school’s recent spring dance at the Fulton War Memorial. Several school districts in Oswego County participated in the recent dance, including full-day and half-day students from OCB. Millennium Music Mobile DJ Service from Oswego provided the music for the event, playing some of today’s hottest dance songs along with all of the students’ requests.